THE DIRTY ARMY: Nik, meet Makayla Lynn Roxanne Taylor, a girl who’s been 18 since 2014. 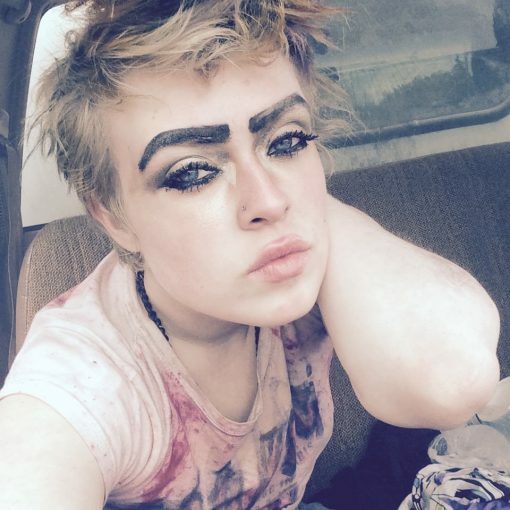 She makes regular appearances on social media trying to get rides from guys every day. If she likes you, all she’ll do is try to scam you from some money and get a ride to another spot where other guys are waiting for her or a place where she can smoke her meth with others in peace. If she doesn’t , she’s been known to ROB guys at knifepoint. She always carries a chef’s knife or something along those lines in secret. To put it lightly, this crack and meth addict is just plain dangerous. God knows what story she’ll give you about her sad life, but in real life, she’s really a lost girl from Petitcodiac, New Brunswick (a fishing town) who’s broken the hearts of her entire family and can be tracked on Facebook or Whisper. She claims she’s a native Calgary girl, but there’s enough proof on FB to find out how she was an overweight kid who for some reason came all the way across the country. It is a sad story, but the girl she is now is armed and dangerous, and is doing her best to fleece guys in town here. How she’s still ALIVE with all that drug use is absolutely beyond me. What the hell is that?